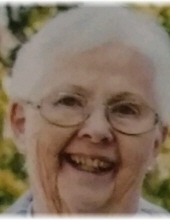 Margaret Kelly Jackson, 87, of Varna, passed away Saturday February 2, 2019 at OSF ST. James Hospital, Pontiac. Cremation rites have been accorded. A visitation will be held Saturday February 9, 2019 from 1:00 to 4:00 pm at Calvert-Johnson & Froelich Memorial Home, Toluca. A memorial service will follow at 4:00 pm. Inurnment will occur at a later date in the Camp Butler National Cemetery, Springfield. Memorials may be made to the Shriners Hospital for Children. Margaret was born September 28, 1931 in Lee, Massachusetts, to James Anthony and Ellen Gertrude (Fahey) Kelly. She is survived by her husband Donald Ray Jackson of Varna. Also surviving are her children, Daniel (Marjorie) Jackson, Kirkwood, MO; Thomas (Patricia) Jackson, Hazelwood, MO; Bob (Kathy) Jackson, Minonk; Amy (Tom) Chalmers, Springfield, twelve grandchildren and fourteen great-grandchildren. She was preceded in death by her parents, and two brothers, James and David Kelly. Margaret graduated from St. Mary’s School of Nursing in Pittsfield, MA. She worked as a registered nurse, and at the time of her retirement was Director of Nursing at Beulah Land Christian Home, Flanagan. Margaret touched many lives, and was an inspiration in the medical field. Her Irish heritage was a great source of pride, but Mitzi’s greatest love of her life were her family and friends. "Email Address" would like to share the life celebration of Margaret Kelly Jackson. Click on the "link" to go to share a favorite memory or leave a condolence message for the family.